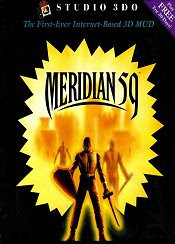 Meridian 59 is an online role-playing game (RPG). Online RPGs are also referred to as MMORPGs, MMOGs, and other acronyms. It's a very confusing bit of alphabet soul for a very cool concept: you will get the opportunity to meet and interact with hundreds of other players in a computer game. But, you will find your favorite RPG elements in the game: you can wield swords and shields and cast spells in order to vanquish horrible monsters, run quests for citizens of the various towns, explore areas while searching for adventure, and build a unique character that can be recognized for his or her individual heroic actions by others. You will make friends, perhaps make some enemies, and have fun playing in a fantasy world.